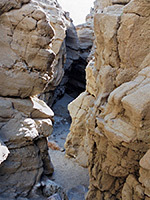 There are many short slot canyons in the California deserts, enclosed not by the brightly colored sandstone of the Colorado Plateau, but by predominantly dull-colored, grey or brown rocks, often conglomerate, where more solid layers alternate with looser, pebble-containing strata. 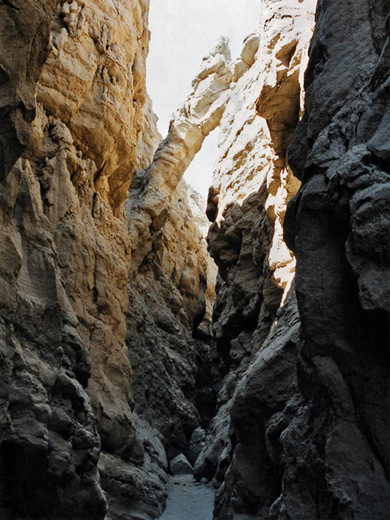 In Anza-Borrego Desert State Park such ravines are found mostly in the badlands towards the east, including the foothills of the Vallecito Mountains, the Carrizo Badlands in the south and the Palm Wash area in the north. Another area with a few slots is the Borrego Badlands between roads 78 and S22, and the most frequently visited is known simply as the Slot, close to Hwy 78. One and a half miles east of the junction with Borrego Springs Road and 5 miles west of Ocotillo Wells, a dirt track - Buttes Pass Road - heads north across flat, sandy ground towards a ridge of low hills. The track forks halfway to the westernmost peak (West Butte), and the left branch climbs a little to the head of a ravine (Hawk Canyon) then bends away to the southwest, eventually crossing the same ravine lower down. The Slot is the mile or so between these points, where the drainage is quite enclosed, particularly so for a 200 yard section in the middle, and it can be followed starting from either access point. 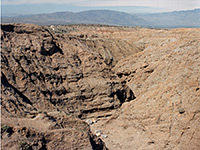 4WD vehicles can drive up the canyon floor from the downstream end for a short distance. 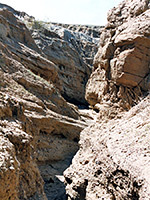 The Slot is the most visited slot canyon in the state park and is marked on the official map. Buttes Pass Road which leads to the upper end should be passable by all vehicles; if not it takes less than an hour to walk the 2 miles from CA 78, over gently sloping, cactus-covered land that has various places good for camping (which is allowed free anywhere in the park). The canyon at this point, just upstream of the narrows, has similar features to parts of Cathedral Gorge in Nevada - many small branches with mud walls, pinnacles and other eroded formations. 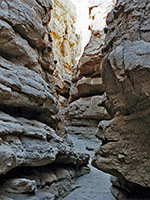 Lower down, the wash cuts through a more resistant sandstone layer and for a few hundred yards becomes a true slot canyon, often quite dark due to overhanging cliffs above and in places just a few feet wide. The colors are rather drab though - light brown/grey and generally without nice reflected light patterns. The walk through is easy, and soon the passageway opens out to the section accessible by vehicles, by driving up the canyon from the point where it is crossed by Buttes Pass Road. Soon after the end of the narrows there are several climb out routes. A few short side canyons join from the right side but these do not extend very far.